Opened in April 2010, this stunning 9 acre lake is in the shape of a long bowing arch with an average depth of 12 feet. 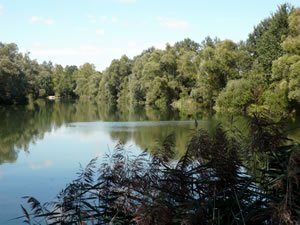 We believe this lake will ideally suit the angler who may feel a little lost in open water, as our snaggy, over hanging trees, shrubs, gullies and margins are at a sensible casting distance. There are 4 double swims strategically placed around the lake mainly on one bank for the use of a maximum of 6 anglers fishing in pairs. Each designated gravel lined swim comes with full use of its own weigh station consisting of weigh post, euro unhooking mat, weigh sling, along with a timber constructed gazebo complete with bench table and cooking area. All of the swims have electrical points for charging mobiles, bait boats, DVD players and other small voltage electrical items an angler may need to bring. We also have push bikes at each swim for the toilet and bait runs. Fish stocks consist of 2.75 tonne of Royal Strain Carp from 24lb to 71lb with many of these fish in the 30lb, 40lb and 50lb plus bracket. There is also an original stock but its numbers and sizes are not completely known to us. You are able to drive up to your swims, with full use of on site toilets and showers. Alternatively send us a message via our contact us page, we will get back to you as soon as we can.